Your body is going to be tired. You think three-hour training sessions are hard? Try a six-hour burn with pressure and adrenaline and cheering. It’s awesome, but it’s exhausting. Don’t forget to eat and drink throughout the day! Nothing too heavy, but nuts, fruits and berries (what one of my trainers calls “bird food”), protein bars, and lots and lots of water will keep you powered up. Your body is using fuel at a rate it’s probably not used to, so be sure to keep your gauge on full! Your fingertips are maybe the most important part of your body for climbing – and the most likely to fall apart. 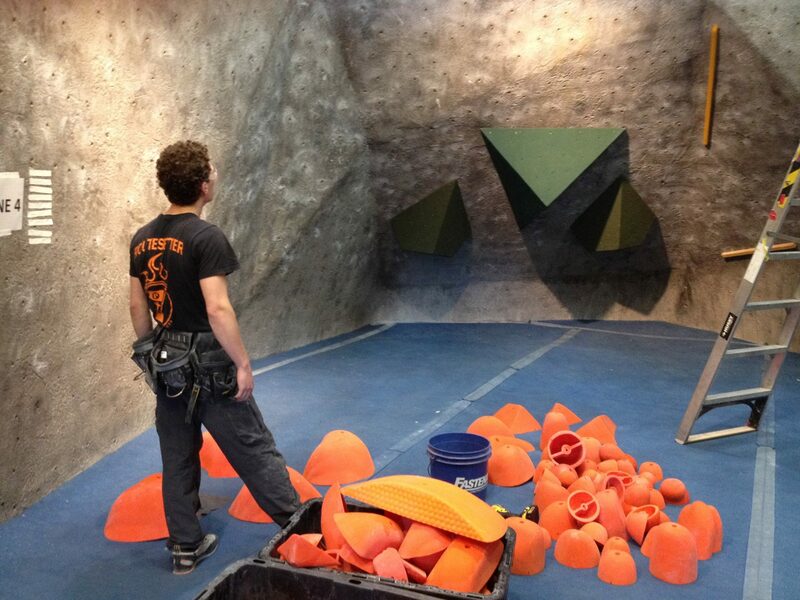 Especially at indoor comps, the holds are brand new and super-textured. Be sure to respect your tips – think about using your entire hand, don’t spend too much time on one project, save your skin for the problems you know you can send. Take breaks occasionally and be prepared to take a few days off after the comp. The night before, maybe take some time to file down your calluses to avoid flappers. Check out our article on callus care for more information! Don’t be like this guy. Credit Ryan Patterson. Competitive rock climbing is hard. It can be really stressful, especially if you’re new or if you’re feeling extra pressure to perform. Maybe you really want to beat the guy in your category who beat you last time. Maybe you want to win to prove something to yourself. Maybe you just get nervous when people watch you climb. That’s part of the game, but channel your jitters into positive energy. Hit a few problems you know you can send. Cheer for your teammates and other competitors. 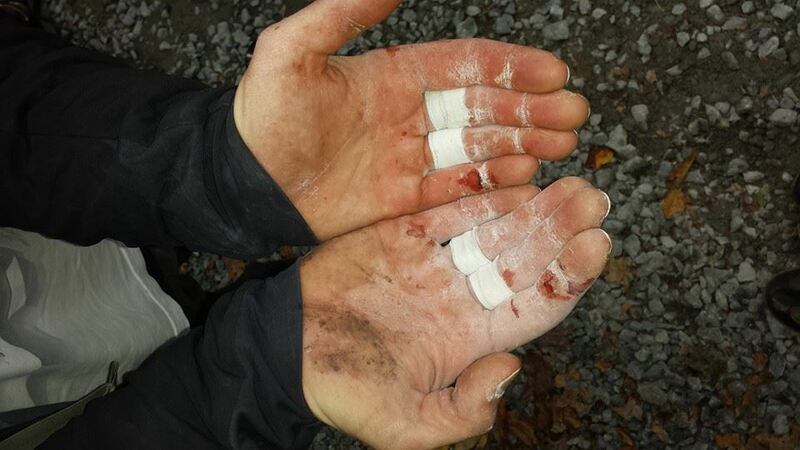 Remember – you’re a climber, this is what you do. 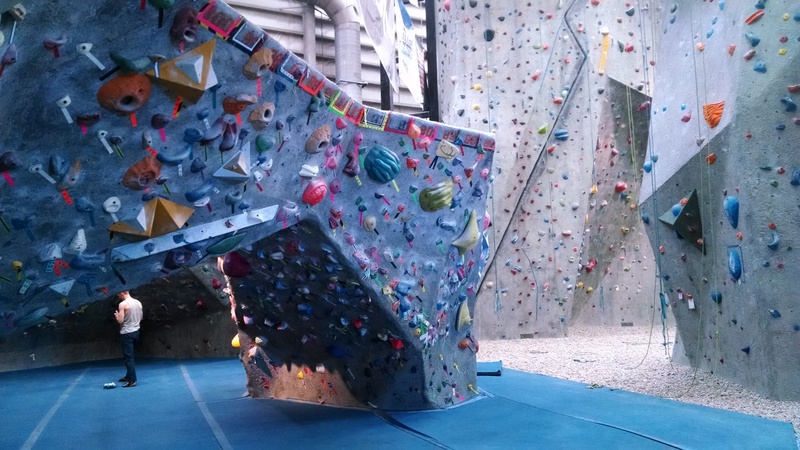 Climbing is, by its nature, an individual sport, but comps are all about the people and the energy. You’ve trained for this, but the world won’t end if you don’t win. (Trust me – I don’t win at comps all the time and I’m still here.) Set your goals, but don’t be bummed if you’re having an off-day. Enjoy the quality setting, quality people, and quality time doing something you like to do. Because you wouldn’t be here if you didn’t like it, right? The ABS comp is Saturday, October 25th, from 10am-3pm. The gym will be open for normal business after 5pm.